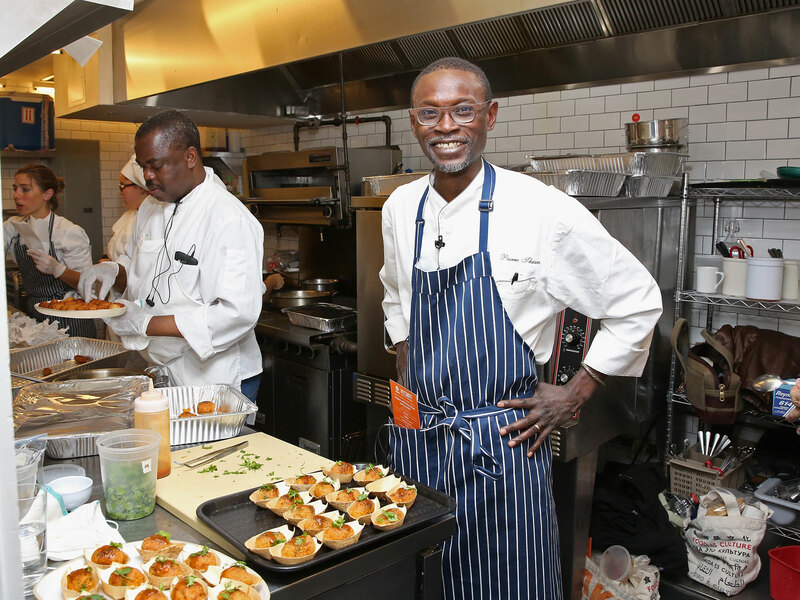 The Senegalese-born chef of Le Grand Dakar fame opens his long-anticipated new restaurant in Harlem's Africa Center. Pierre Thiam is sitting at a round table at a restaurant near Gramercy Park in Manhattan, his hands illuminated by sunlight pouring through the bay window behind him, offering warmth on a cold winter day. “When I go to Gullah Island, I’m in Senegal completely,” he says, his eyes bright. He recounts how the two locations, both dear to him, are linked in their food and culture. The Gullah cuisine of South Carolina's Lowcountry and Sea Islands, with its emphasis on rice and seafood and intrinsic, almost familial hospitality, made him feel like he had returned to his native Senegal hundreds of miles away. “Teranga is a top value in Senegal. It’s very key,” Thiam says. The atmosphere, service, and design of Teranga centers around what “a Senegal experience would be for someone that arrived” there, but the menu doesn’t belong to one country; instead it combines influences from Mali, Nigeria, Côte D’Ivoire, Senegal, and other African countries. His refusal to define the food as belonging to one country is intentional. “I love history and I love food, so that’s the story I want to tell,” he says. Thiam sees the cuisines of the western coast of Africa as deeply connected because of natural resources and tribal groups whose influence on the area's food and culture pre-date any creation of borders, which were drawn by non-Africans. “Those borders aren’t real; they were placed upon us,” Thiam says. He doesn’t see dishes or ingredients as belonging to one country or another—it’s all part of a shared history of the continent. Teranga’s jollof, for example, is made with fonio cooked in a spiced tomato broth instead of rice. Jollof is one of the most beloved dishes of western Africa, so prized that there dedicated to declaring once and for all which country makes it the best. Traditionalists may be upset at Thiam’s take with fonio, but that’s what he wants. “It’s meant to just make fun of this whole fight and present it differently,” he says. Thiam’s personal journey as a chef, learning about West Africa and how the food has spread to other parts of the world, is also present on the menu. “My food has been evolving in ways that my experiences have been evolving,” he says. The experience of opening , a restaurant in Lagos, Nigeria, led him to see the similarities and differences between the countries that are so close on the western part of the African continent. “In my travels to Côte D’Ivoire, I realize I always keep learning; it’s a constant learning process,” he says. He has brought these lessons to the menu at Teranga and combines them with some of the most iconic African dishes. Plantain and red palm fufu are made with organic red palm oil, and mafe, a sweet and salty peanut sauce, is inspired by his travels in Mali and Senegal. Thiam also sources Liberian "ruby" red rice for the menu from farmers in Liberia. Yolele, the term, loosely translates to “let the good times roll,” and it's the guiding principle of Teranga. Offering a menu of African dishes in addition to selling African products is a way of creating a line of connection between western Africa and the United States, he says. That’s what he hopes diners walk away with from Teranga: the story of bringing this food to new borders and seeing the similarities that exist between the two. Teranga, The Africa Center. 1280 Fifth Ave, New York, NY.